:: Meeting at: The Bluebird Cafe. Car park on Lake Road just to the south of Coniston at 10:00am for 10:30am start. The Lake District National ride was cancelled earlier in the year due to excessive amounts of snow, but there was always talk of a re-visit later in the year. Well here it is. With the Lake District road ride taking place on the Saturday, this ride will be ideal for anyone who wants to make a weekend of it. Or you can just come up for the Sunday and still get a great day's riding in. :: Terrain: Rocky and natural Lake District singletrack and trails with some climbs and great descents. It also uses sections of the North Face Trail in Grizedale Forest. This route avoids the really big Lakeland mountains and, while challenging in places, is very suitable for riding on an a retro machine. Be prepared for the usual changeable Lake District weather. There are some short road sections but the route is mostly off road. A few technical sections and plenty of glorious views and fast descents. There are also easy to follow short cut options for anyone who is struggling. :: Route Description: This route has a great mix of natural trails, forest singletrack and incredible Lakeland views. The ride starts at the Coniston Ferry landing. The Bluebird Cafe is a great place for a pre-ride coffee and bacon bap should you wish to get there early. The route begins with some great singletrack and then a narrow lane up to High Tilberthaite. Then it's across past Hodge Close before turning west to Arnside Intake. From Knipe Fold the ride continues on some quiet lanes and to the edge of Grizedale Forest at High Cross. We'll join the North Face Trail and follow it down to the Visitor Centre for some food. After some food we'll continue up to Lawson Park, before an optional extra section and then a great descent down and out of the forest to Bank Ground. Then it's a short roll back around the northern tip of Coniston Water back to the start point. 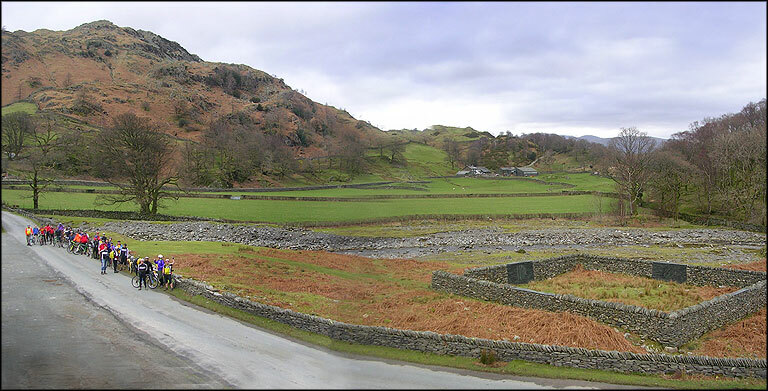 :: Accommodation: There are plenty of B&Bs in Coniston and several Youth Hostels nearby. There are also loads of other accommodation options in the Lake District for anyone wishing to make a weekend of it. One of many great descents. RIGHT THATS IT, THATS REALLY IT !!!!!!!!!!!!!! First run of this and you cancel it from beneath my feet all because of a wee bit of the white stuff leaving me looking foolish outside the Bluebird Cafe with my Neon Pink retrobike. Now you rerun it when I'm on my hols at the Loopallu music festival in Ullapool as far away as you can get. Are you in or out on this one Pete? Will let you know as soon as I can pin him down! Okay good. I don't really want to be staying over if there's nobody to ride with on Sunday. Location: He doesn't live in "The You-Kay"; he lives in GREAT BRITAIN! Sorry I won't be able to grace you all with my presence, I'll be among those less fortunate than ourselves this weekend (That is I'll be visiting Larndarn, innit). Celebrate Yorkshire Day; put weedkiller on your red roses! Hope it's not just you Paul, riding along talking to yourself wouldn't suit you!